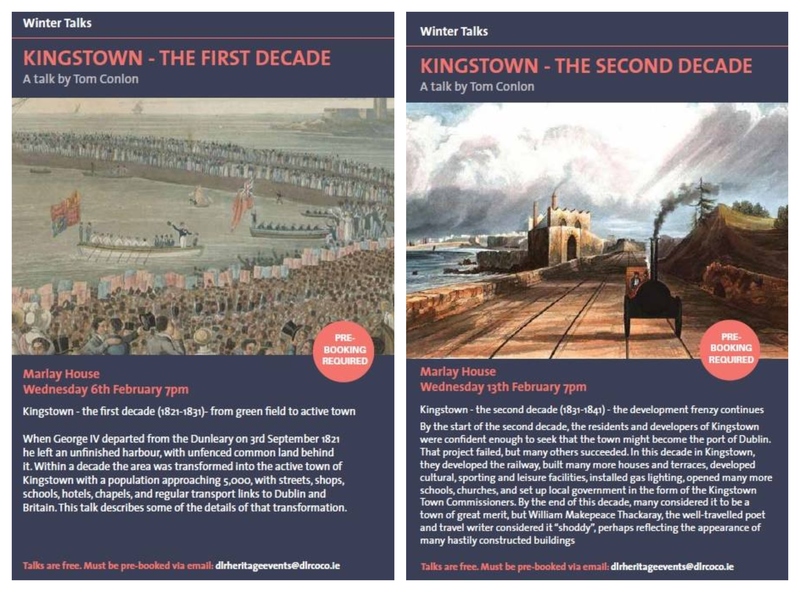 Over the next two Wednesday evenings (6 & 13 February), at 7pm in Marlay House, there will be two fascinating talks, by Tom Conlon, on the history of Dún Laoghaire town in the first half of the 19th Century, as part of DLR Heritage EventsWinter of Heritage programme. 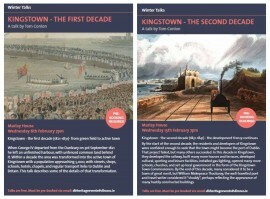 This talk will cover the transformative period from when King George IV departed from “Dunleary” on 3rd September 1821, through the following ten years, when an unfinished harbour, with unfenced common land behind it, was transformed into the active town of “Kingstown” with a population approaching 5,000, with streets, shops, schools, hotels, chapels, and regular transport links to Dublin and Britain. This second talk will start with the the confidence of the residents and developers of Kingstown that led to their seeking that the town might become the port of Dublin. the development of the railway, the construction of impressive Victorian houses and terraces (many with gas lighting), and the development of cultural, sporting and leisure facilities. It will also look at the establishment of the Kingstown Town Commissioners (the predecessors of Dún Laoghaire-Rathdown County Council. Both these talks are free and open to the public, but you must register in order to attend, by emailing dlrheritageevents@dlrcoco.ie.